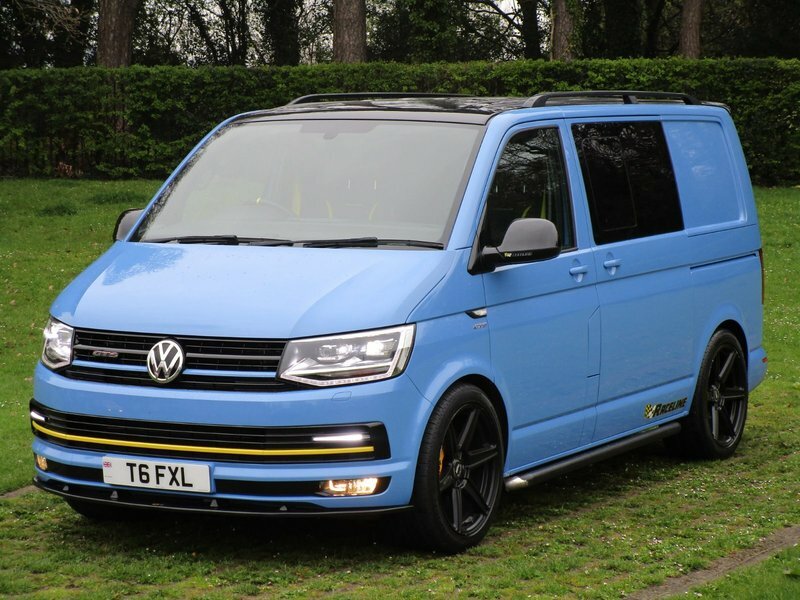 VW T6 TRANSPORTER 180PS DSG HIGHLINE, CONVERTED INTO A STUNNING 245 BHP CUSTOM RACELINE GTS IN BMW M4 YAS MARINA BLUE. THIS SWB VW T6 RACELINE GTS STARTED OUT AS A STOCK VOLKSWAGEN TRANSPORTER T6 180PS DSG HIGHLINE KOMBI, WITH ADDITIONAL FACTORY SPEC INCLUDING LED HEADLIGHTS & TAIL LIGHTS, TWIN SIDE LOADING ELECTRIC DOORS, CAB CARPET, POWER FOLDING MIRRORS AND HEATED FRONT SEATS TO NAME A FEW. ALL THE USUAL RACELINE GTS EXTRAS INCLUDING BIG BRAKES, RACELINE NAPPA LEATHER HEADLINE & UPHOLSTERY, CARAVELLE CENTRE CONSOLE & DOOR CARD UPGRADE DRL'S, FULL GLOSS BLACK FINISHING TO CAB AREA TO NAME A FEW. THIS THING IS TRULY MAGNIFICENT! CALL US NOW ON 02920 026342 or come and see us at Caerphilly Van Centre, just 5 minutes from Junction 32 of the M4. Full range of finance packages can be offered by us and CVC is authorised and regulated by the FCA. Check us out on eBay, Gumtree, Autotrader, Facebook and our website.